Charming, roomy ,cottage-style single home in Brigantine NJ. 1 1/2 blocks to a beautiful, family-oriented beach and 1/2 block to the bay and public dock. 4 bedrooms,each with cableTV, 2 full baths and kitchen recently updated. Living room plus den with large screen HDTV. Pet friendly. Large screened back porch. Outdoor shower. The bedrooms are set up as follows: 2 with Queen-size beds, 1 with a double bed and 1 with two twin beds. Additionally, there is a futon in the den that opens out to a double bed. A rollaway bed and Pack-N-Play are also available. Central in main living area supplemented by window units in 3 bedrooms. Very spacious and welcoming on the inside. My family and I had a great week in Brigantine and this property certainly was a big part of the reason. Highly recommended if you are looking for a stay in Brigantine. We had a wonderful stay! 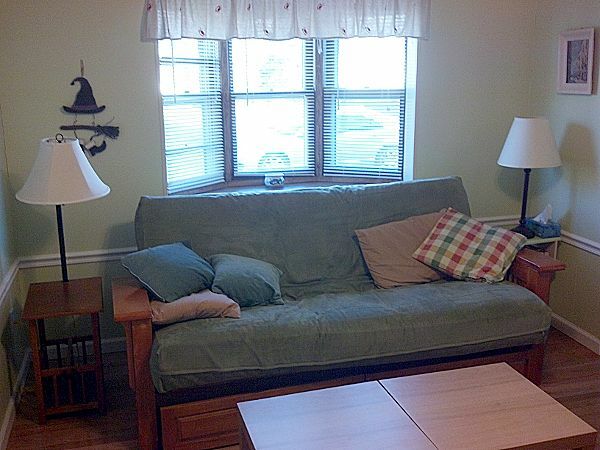 The house is very clean and has everything you need to enjoy your stay. It was in easy walking distance of the beach and several good restaurants. Janice is very professional and quick to answer any questions. The screened in porch and back yard were wonderful. The young people could hang out on the porch while the baby and the grandparents slept. Hopefully we will be able to stay there again for many years to come. Great house & great location! The house was adorable with plenty of room. Very clean & well kept! Will definitely book here again. Owner very nice & accommodating. Spacious beach house, in a perfect location. The home is beautifully maintained, with everything you need for a great beach vacation. A short walk brings you to a gorgeous beach. Plenty of shopping and places to eat within a short walk or drive. Thanks for a lovely vacation! Great place to stay, the house is well kept, nothing fancy. Just a typical fully furnished beach house. Upon arrival, we were more than pleased with the size and location for the lovely beach home. The home was just as described and clean and welcoming. There was more than enough room for our family and 2 small dogs. We never felt we were on top of each other. The screened in patio was a great place to store our beach belongings. The beach was only a short walk 1 1/2 blocks away; the bay only 1/2 block. The owner was always helpful and answered emails quickly. Brigantine offers everything one would need for a relaxing vacation: grocery stores, shops, restaurants, mini and executive golf, fishing, swimming and fantastic morning donuts at Aversa's Bakery. Driving into Atlantic City or Ocean City is only a short drive away if you're looking for the traditional boardwalk experience,. We look forward to returning to this beach home next year. Located at northern end of island. 5 minute drive to Atlantic City casinos. 1/2 block from public dock and 1 1/2 blocks from beach.